Fittingly held at Berkleouw Paddington Bookshop, Lisa welcomed guest and highlighted the need to approach your years with gratitude and joy. “As we get older we want to be challenged and to feel like we are continuing to grow long past a time when we look at previous generations, when I look at my mum’s life, when she was the age that I am now, I think of a really, sadly, a very closed in life and that I think, as more and more of us realise what is possible in our later years it is something that you embrace with incredible joy and enormous gratitude. And the good news is, the truth is, we are all ageing! That’s good news, right? Everybody’s ageing at exactly the same rate,” said Lisa. Lisa stressed the importance of having good role models to look up to that are living life as Marcus’ book encapsulates, that is, living their extended years with joy, passion and wisdom. “There are so many wonderful role models out there, for all of us, for how to live a fabulous life beyond 50. Personally, I look at someone like Meryl Streep and Helen Mirren – I mean, there are so many incredible women who are just living lives of even more purpose, even more meaning, even more joy, even more comfort in their in own skin than we’ve ever seen before,” said Lisa. 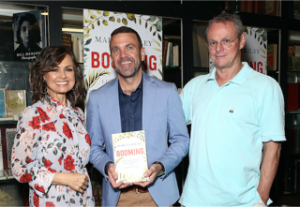 Booming is the result of Marcus’ 20 years’ experience in the ageing industry, he advocates that by embracing positivity, planning how you want to live the rest of your life and understanding the need for purpose, we can all age successfully. “My book is the result of my many years involvement in the world of ageing and I believe, that when it comes to ageing, people have a choice. People can accept the negativity that abounds about getting older, concede that they will decline and wither on the vine. Or we can choose to seize the opportunity to revel in our extended later years with joy, passion and wisdom,” said Riley. ‘I hope that my book encourages people to do just that and engage in healthy ageing,” he added. Riley’s novel sheds light on the challenges and delights (too many to mention!) of being an older person, and in doing so, helps provide a blueprint for successful ageing.